Just finished reading The Barefoot Runner by Paul Rambali. The book is written in the same form as a novel but is essentially a biography of an Ethiopian runner called Abebe Bikila. Bikila was the first black African to win an Olympic medal (gold in the 1960 Rome marathon) and, because the shoes they found for him were a poor fit, he ran it barefoot, the way he had been all his life and the way he had trained. Four years later he won the Gold again in Tokyo wearing shoes. Ethiopia. Bilika becomes a hero and comes to represent more to his country's people than just a great athlete. The backdrops to the story are Ethiopia's struggles with modernisation and Selassie's downfall. He was desposed by a military junta called the Derg. The country has been a mess of coups, droughts, famine, uprisings, and refugee problems, more or less ever since. If anyone wants to read it next email me your address and I will send it to you! Turns out it is worse than the garage first thought and the car will cost more to repair than it is worth. The drive shaft is shafted. I am tempted to try and do without a car for a few months (or possibly forever). Tonight I ran to Inverkeithing (4.5 miles) and caught the train to South Gyle and ran home (1.7 miles). I'm pretty sure I can sustain this way of commuting (although occasionally I might cycle) and it will be a great base for marathon training. As for weekend trips, shopping, etc., using bike/bus/feet will be less convenient but surely possible. I can always hire a car from time to time. However if I spot a cheap, small, economical and reliable looking car I could be tempted. . .
Navigating my way out to Rosthwaite, in the Lakes, I turned up the Coffee Break Spanish podcasts to disguise the strange noise the wheel makes, and occasionally had to wipe the window clear with my arm as the heater has stopped working. I found the camping barn and ran out of the rain through the front door of the barn. This turned out to be the toilet. Next attempt I found Alastair and Trevor brewing up some mulled wine. The cards came out and a heated game of "Beat Your Neighbour" ensued. Tranquilised with Trev’s Homemade Cherry Brandy, I fell asleep listening to wind and rain on the other side of the tiles. In the morning I woke to Trevor’s repeated grumble of “two thirty-two”. It turned out that some Londoners arrived in the night woke him up and then began top-volume snoring which kept him awake. On Saturday we did a grade 1/2 scramble on Great Gable called the Napes. The first obstacle was Napes Needle. This was described in the guidebook as a “steep, strenuous, slippery, squirmy, struggle” or some such sibilance. It was pretty tricky in the conditions we found it in and we abseiled off the other side. The route then took us across a gully, behind a flake (giving a few minutes respite from the wind), down a steep wall, and across another gully full of loose rocks (several of which bounced off my shoulders). Then we turned up just before the impressive Sphinx rock (shown in someone else's photo (taken in much nicer weather) I nicked off the internet as I forgot my camera) to join Sphinx ridge. On the ridge we had to make an exposed step onto a small out of sight ledge over a boulder. It was a bit like stepping on the ledge at the bottom of my wardrobe, whilst hanging onto the shelf looking for socks. The only difference being the couple of hundred meters of drop beneath my feet. From there to the summit was happy and windy scrambling which petered out into a walk. We had our lunch out of the wind on the other side of the cairn at the top and then followed a track down to (an extremely) windy gap where you can stand at 45 degrees to the ground. Then, on hands and knees practically, we climbed Green Gable and more easily walked into the valley, north of Base Brown. The looming black clouds gave us a brisk pace across the flat and then Trevor and I pegged it down the track by the Sour Milk Gill waterfalls, over the bridge and back to the car. Just caught a minute or two of rain. Alastair arrived a few minutes later looking soggy. Some open-boaters stayed in the barn that night with exaggerated and amusing stories, and a petrol stove that stunk the place out. We ate all the remaining food, approximately six courses, with two puddings, between rounds of "Big Two". Fortunately the canoers did not snore. With the forecast for Sunday not being too good, we decided on a walk up to Scafell Pike. Our Route took us up by Sprinkling Tarn, over Broad Crag and up to the summit. We ate lunch on the summit in the bothy bag and the weather turned. In snow we followed a continuous trail of cairns along the "corridor route" on the way back down to Sty Head. As we dropped height the snow became rain and we got a drenching as we traced Sty Head Gill past Stokley Bridge to the car parked at Seathwaite Farm. We dried off and had tea and biscuits in the back of Alastair's car. All in all a good weekend considering the weather. I especially like the fact that I have a sporting chance of being able to pronounce the names in the Lakes. Bad news followed, as I drove home some lights came on on the dashboard. Got it home and took it to the garage today. Turns out the wheel bearings have collapsed taking out the ABS sensor and the brakes. going to cost £455 to fix. Borders Cross Country Series continued with a four (and a bit) mile loop around the John Muir Country Park. This started off with a down-wind dash through a water-logged salt marsh, and then we turned into the wind and hit the beach. 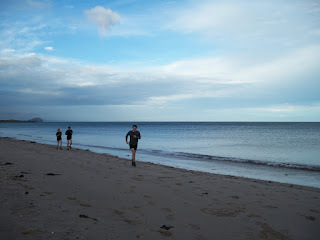 We followed the wet and compact sand to a loose sandy spit, across a river, and eventually turned out of the wind again and headed back through some woods to the finish line. Then a group of us turned around and ran it again in reverse. We finished just as the weather deteriorated into a gale. We took shelter and had a good feed, at a farm shop cafe. 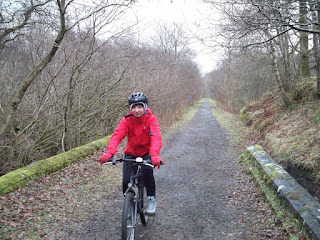 Set off from Callander and followed NCN 7 up to Strathyre. Weather was so-so, bit of drizzle here, bit cloudy, bit cold. Views of the loch were gorgeous. The water was still and the mountains and trees perfectly reflected. The track had a few steepish climbs, but was otherwise straightforward and relaxing. Saw some soggy looking highland cows and had a cup of tea, bowl of soup and sandwiches in a hotel in Strathyre before returning the same way back to Callander. The Hogmanay street party last night was great and it was definitely worth paying to go see the bands. Groove Armada do a fantastic live show, with I see you baby, At the river (the trombone player was superb), My friend and Superstyling my favorites. The fireworks were really loud, close and impressive above us from the castle. We polished off a plastic bottle filled with vodka and coke and walked half way home till the bus picked us up. 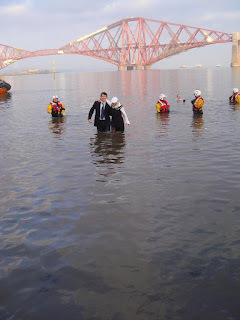 Got in the water with Magda down at South Queensferry this morning for one of the more bizarre Scottish traditions. The Loony Dook is where a bunch of nutters go for a dip in the sea on new year's day. We decided to dress up smartly but not everyone did. There were girls in pants and bra, and a man in a wedding dress. Honestly, it was inconceivably cold. Could only manage going up to the top of my thigh, no further. More photos on mau.lemon.pl.